Kauai, Hawaii’s “garden isle,” boasts natural wonders like few have ever seen – dramatic cliffs, gaping chasms, and a mountaintop crater that is the rainiest place in the world. 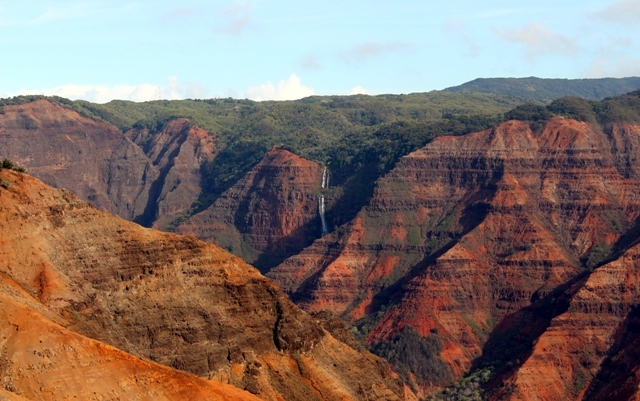 Kauai’s lush forests and valleys hold rare plant species found nowhere else on the planet. And wildlife abounds. 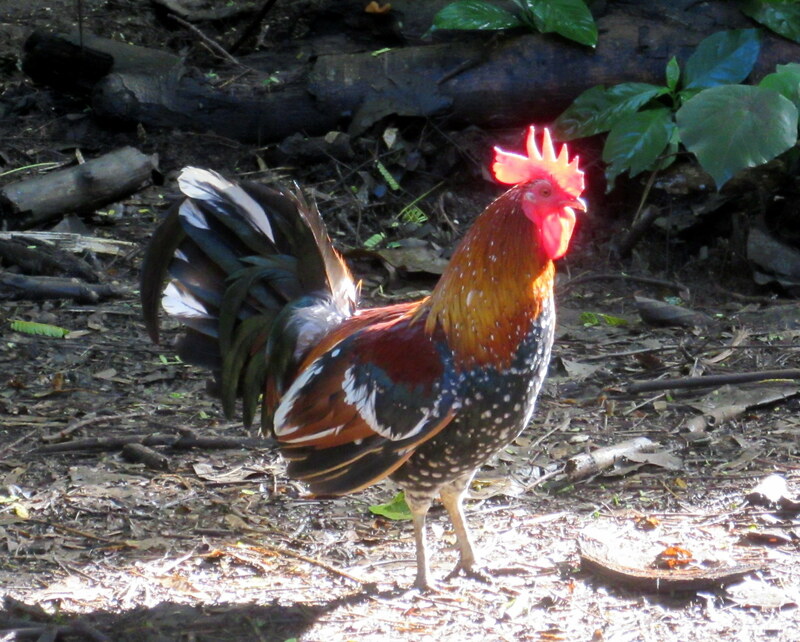 Not only will you find chickens crossing the road in Kauai, you will find them on the beach, in the jungle, and begging for food at just about every place on the island that tourists venture to go. Love ’em or hate ’em, you won’t be able to escape them. 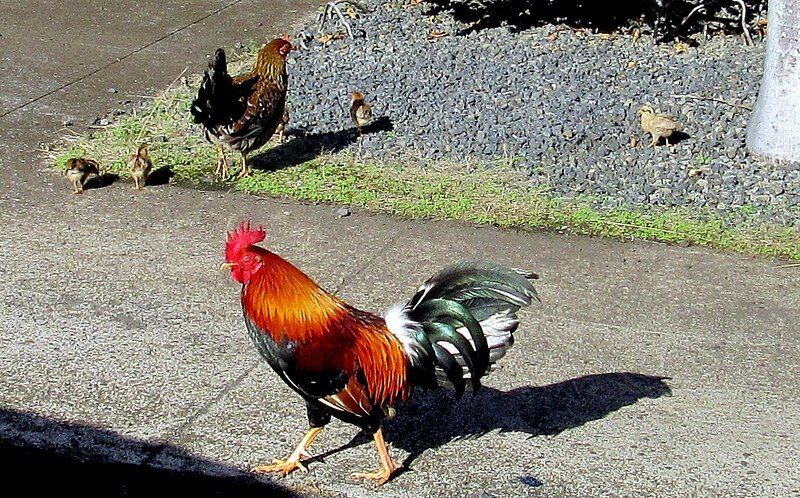 Plenty of Tripadvisor reviews for Kauai accommodations bemoan roosters crowing outside the window at all hours of the day and night. But chicken motifs and logos are just as prevalent in Kauai’s gift shops as chickens are in the wild, so not all visitors to the island are haters. 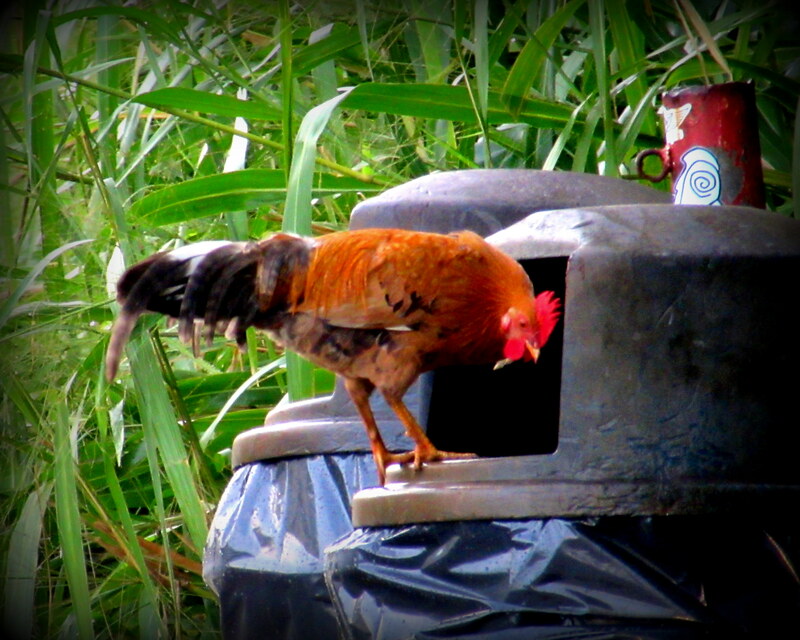 To many, the feral chickens are simply part of Kauai’s many charms. 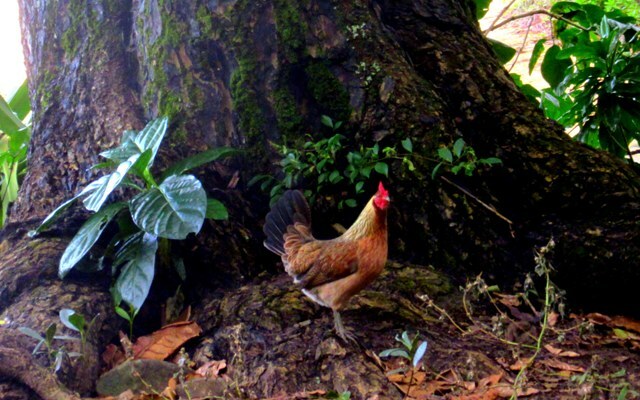 The story of the ubiquitous Kauai chicken begins with a chicken crossing the ocean nearly 2,000 years ago. But to fully appreciate what a feat that crossing was, you have to look back even further in time. 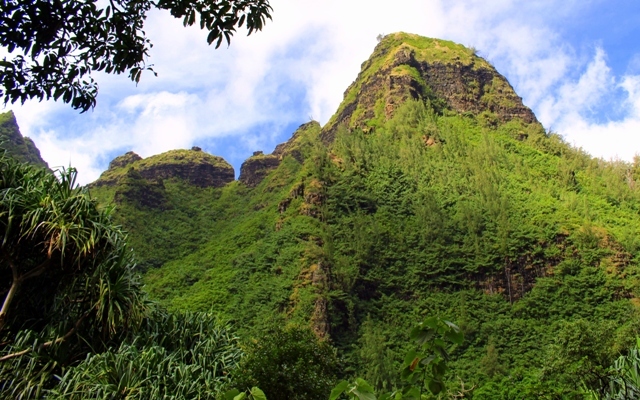 Makana Mountain, formed by volcanic activity, towers above the Limahuli Valley of Kauai. The story of the Hawaiian Islands begins millions of years ago when an undersea volcano began spewing mountains of magma from far below the ocean floor. As the earth’s tectonic plate moved northwest over the volcanic hot spot, the eruptions created a distant archipelago in the middle of the Pacific Ocean. With 2,000 miles between it and its nearest neighbor, the Marquesas Islands, Hawaii is the most remote island chain in the world. Kauai is the oldest of the major Hawaiian Islands. Like all volcanic islands, it was born of lava and rose barren and lifeless from the sea. The first living things to reach Kauai’s shores had to travel thousands of miles over open water to get there. Seeds and spores reached Kauai by way of wind, water, and wings, and plant life eventually took hold. Some birds and insects also made the island their home. But very few species of flora or fauna could survive such a long and perilous journey across the sea. Throughout most of Kauai’s existence, the successful introduction of a new species was a rare occurrence. Then humans showed up and things quickly began to change. 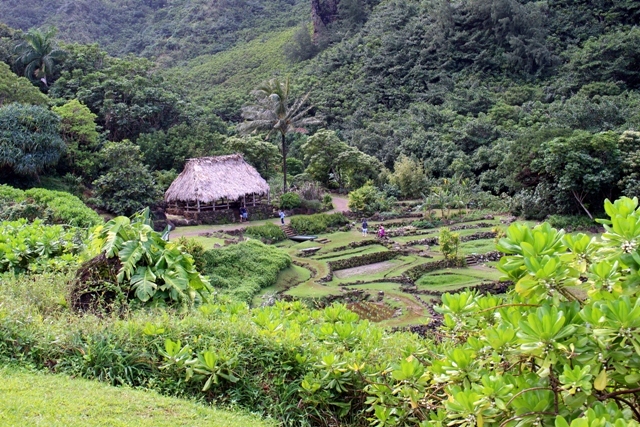 A hale, a traditional Hawaiian house, reconstructed on the footprint of an ancient Polynesian settlement in Limahuli Valley, Kauai. The first humans arrived in Kauai sometime around 200 A.D. These early settlers most likely came from the Marquesas Islands, traveling thousands of miles across the ocean in voyaging canoes without the aid of navigational equipment. With no stops along the way to stock up on food and fresh water during the months-long journey, they had to bring along all of the plants and animals they needed for survival. This critical freight included the red junglefowl, ancestor to the modern domestic chicken. And that, my dear reader, is why the chicken crossed the ocean. 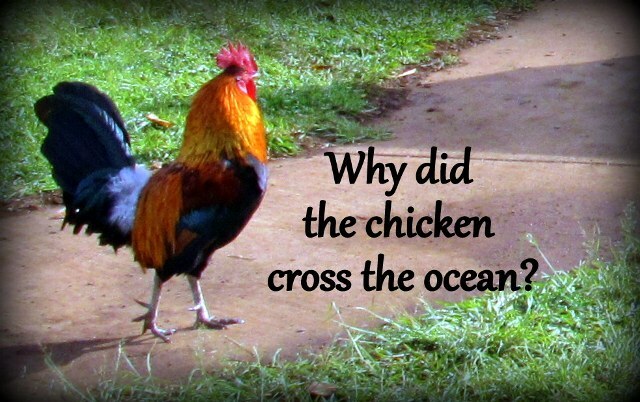 But the story of the Kauai chicken doesn’t end there. In 1778, Captain Cook landed in Kauai near the Waimea River. Cook’s arrival marked the end of Hawaii’s long period of isolation and the beginning of the plantation era. 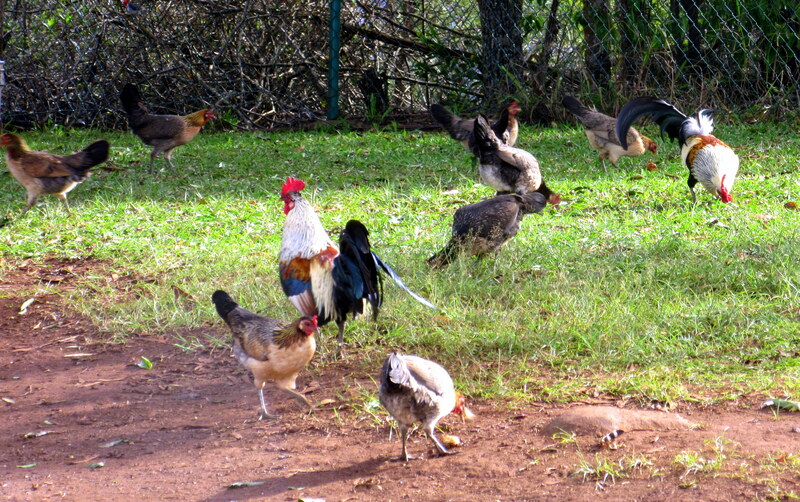 Westerners arrived in Kauai, bringing their favorite plants and animals from home, including – you guessed it – domestic chickens. 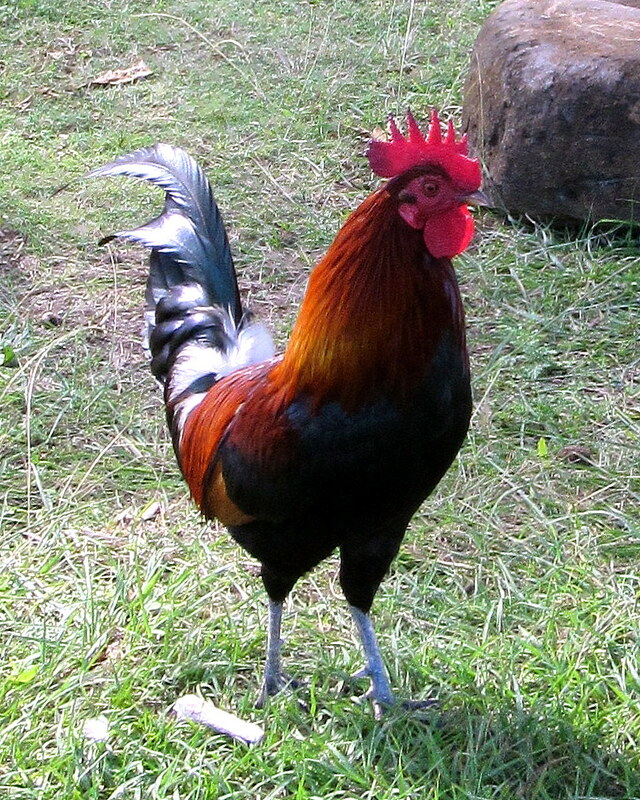 Over the years, the descendents of the red junglefowl that had been introduced by the early Polynesian settlers began mixing with the domestic chickens brought by the Westerners. 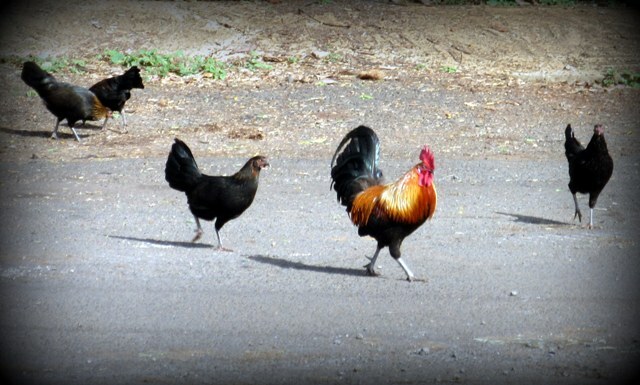 Today’s feral chickens in Kauai are the result of hybridization. Kauai lacks mongoose and snakes, which prey on chickens and their eggs and help to keep the feral chicken population in check on the other Hawaiian Islands. During the height of the sugar industry in Kauai, field fires set to aid the sugarcane harvest helped to control the wild chicken population. But the sugar industry declined in the 1980s, and without natural predators, feral chickens flourished. 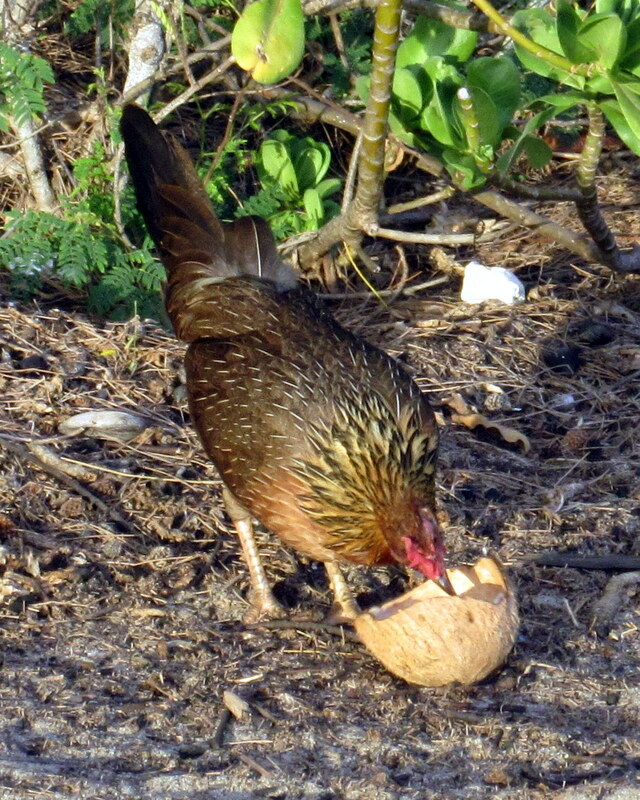 According to local lore, the wild chicken population ballooned after Hurricanes ‘Iwa in 1982 and Iniki in 1992. As the story goes, the storms’ strong winds destroyed the island’s chicken coops, releasing even more birds into the wild. 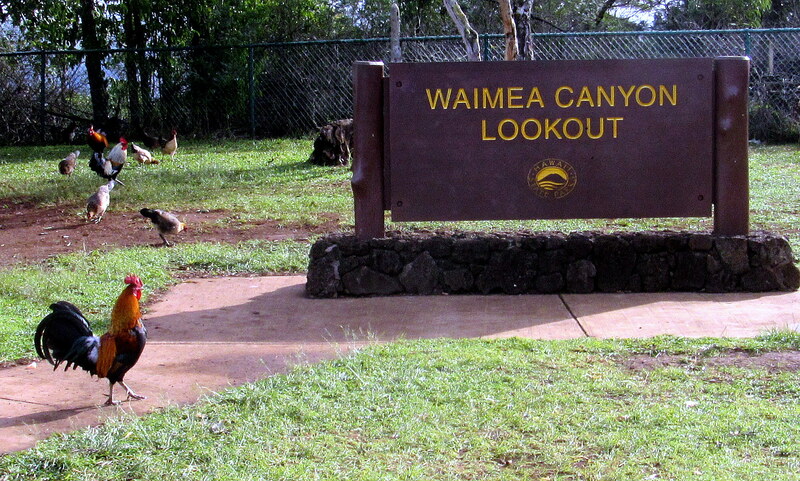 Today, the only real threats to the wild chickens in Kauai are dogs, cats, and automobiles. During my visit to Kauai, I found myself pointing the camera at the colorful chickens almost as often as the amazing scenery. 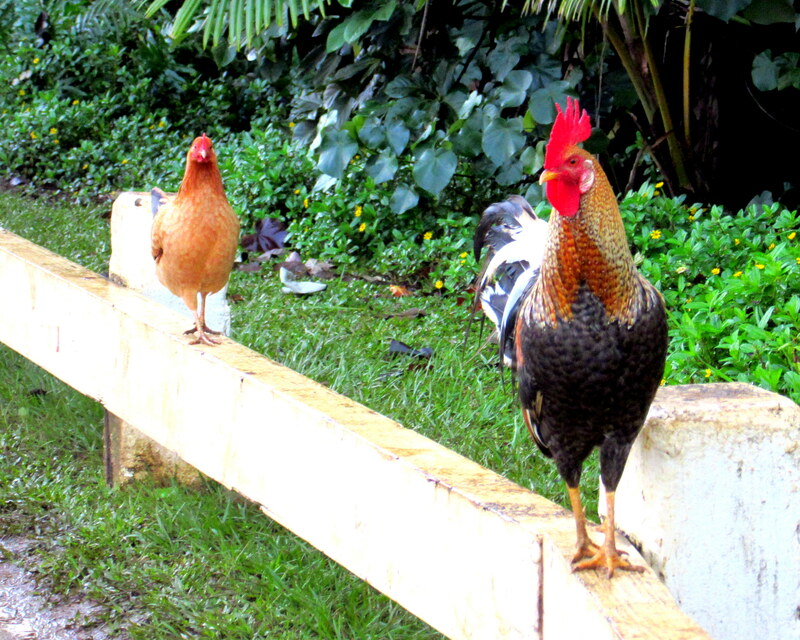 Here are a few of the chickens I came across during my travels around the island. But what chicken wouldn’t cross the road for this view? View from the Waimea Canyon Lookout. Learn more about Kauai’s flora, fauna, and early inhabitants at Limahuli Garden and Preserve, part of the National Tropical Botanical Garden. 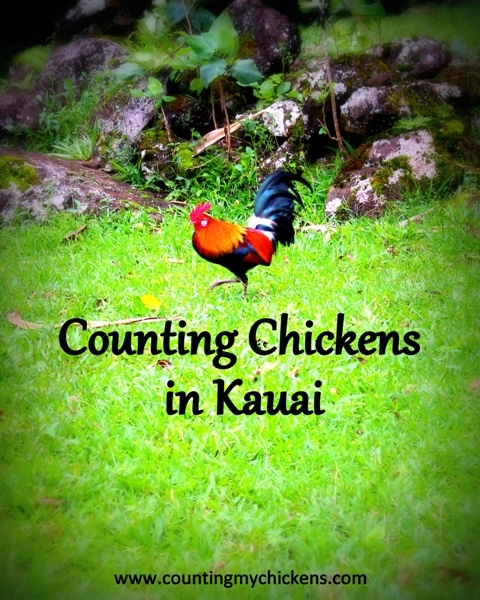 This entry was posted in Living the Good Life and tagged hawaii, travel, wild chickens by Deborah Neyens. Bookmark the permalink.